As i have promised you all i will be posting the recipes of my New Year Eve dinner one by one. My main course were these seafood shells which i learnt from my spanish neighbour who worked in a fancy restaurant. Its basically seafood in a creamy sauce and baked. You can make a lasagna with it…or stuff pasta shells or even bake a seafood pasta bake or just pour it over boiled and sauteed pasta of your choice. I just filled shells with it , topped it with a little grated cheese and put them in the oven to grill till golden. The cream and butter in this recipe makes it quite high in calories so better just eat small portions!! You can use any kind of seafood or fish but i have noticed using white fish is the best. I did not use any wine in the sauce but you can use white wine. I shall give you all the options. Heat the butter and sautee the onions til they start to change color and then add the flour and sautee the flour for half a minute and then remove from heat and slowly stir in the fish stock and the milk and mix well to remove all lumps. Return to the fire and cook till its thickening a bit and then add the prawns and cook till prawns are cooked (do not over cook prawns) and then season with salt and pepper and add the fish and the cream. Mix well and bring the mixture to a boil. Remove from the heat to avoid over cooking. Fill into shells and top with grated cheese OR pour over boiled pasta of your choice. Put the shells into a hot oven till well grilled and golden on top. NITU DIDI TIP: this is an excellent pasta shell filling…or even can be used for a fancy seafood lasagna or a canneloni filling….. 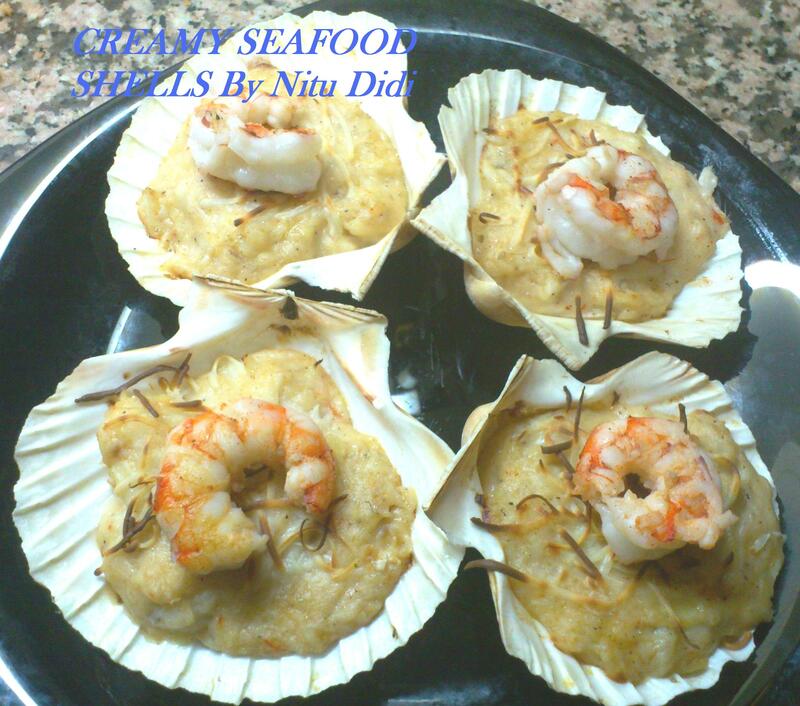 This entry was posted in Something's Fishy and tagged baked prawns, seafood, seafood shells. Bookmark the permalink.